Additional Info: All bedding and linen provided , not provided are towels king size in main ensuite bedroom. 100 pound non refundable deposit, 50 pound bond refundable if there’s no damage, balance to be paid 6 weeks before holiday start date ? Families and couples only, no pets thank you ? Saturday to Saturday bookings only, no short breaks thank you ? 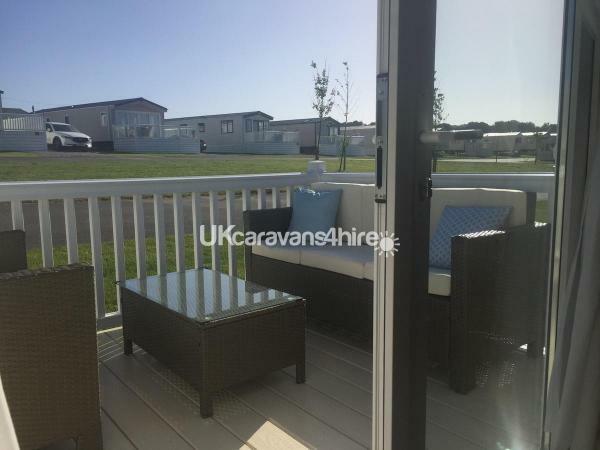 Recently purchased 19 months old ,6 berth 2 bedroom caravan on Trevella Park 5 mins from the beach, outside heated swimming pool, private part of the park, 1 mile from a Morrison’s and Mac Donald’s, from 450 a week to 895 ,wrap around south facing decking with rattan furniture. king size bed in the main ensuite bedroom !2fishing lakes , one of them carp , you can hire tackle if you don’t bring your own , pets corner for the children , free standing sofas in the lounge area ‘There’s a bus service from the camp , if you don’t fancy driving , timetables can be collected from the reception areas, organised nature walks for the children , free to use outdoor heated pool ! Additional Info: 4 children’s play areas , zip line on one , mini golf, heated outside swimming pool,windbreakers to use , please return after use , hairdryer, iron, ironing board, all supplied ! We are the first to rent the van from the new owners and need to share our great experience.It is 5* ,very spacious and feels brand new. Extremely well equipped with quite a lot of extras that you do not always get when renting. Arrived early and the van was ready for use. Milk, tea and coffee provided and the van was pristine. The main bedroom has a king size bed ,bedding is also provided , the room is very spacious with an en suite toilet. There is a second toilet and shower room. Extras in the van , hairdryer ,ironing board and iron.There is free wifi on the site. Cannot fault this van.